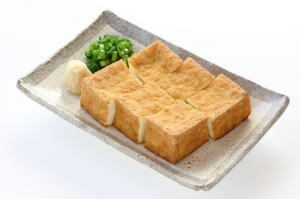 Atsuage Dofu ('厚揚げ豆腐', is classified into appetizer), is known as Tofu Cutlets in English, and 炸厚豆腐 (Zhà hòu dòufu) in Chinese. It is the washoku. Deep Fried Tofu, Atsuage, Atsuage Tofu Cutlet, Thick Fried Tofu. Wheat Flour, Japanese Leek, White Radish, Green Perilla, Ginger.